Many workplaces in the UK like mine offer a “special leave allowance” of up to three working days a year in which staff can undertake volunteer activities. From charity fun-runs to outreach or local community programmes, there are so many ways to support a cause or an organisation that is only asking for a little bit of time, expertise, or just a willing pair of hands. Knowing this, I couldn’t sign up fast enough when a UAL coworker was asking around for people to help with art workshops at The Passage House, a charity whose aim is “help homeless people transform their lives” through a variety of means including homelessness prevention projects, outreach, employment training, advocacy, and more. Included in the Passage’s multi-faceted approach is a rich hospitality programme in which clients can participate in a variety of activity groups, including such things as book clubs, concerts/theatre, and art/craft sessions. London-based artist David Tovey supports participants weekly in their creative expression, and last week [1 March 2018] graciously hosted my co-worker Emily and myself for some drop-in art-making with a few of the residents of Passage House in Pimlico. 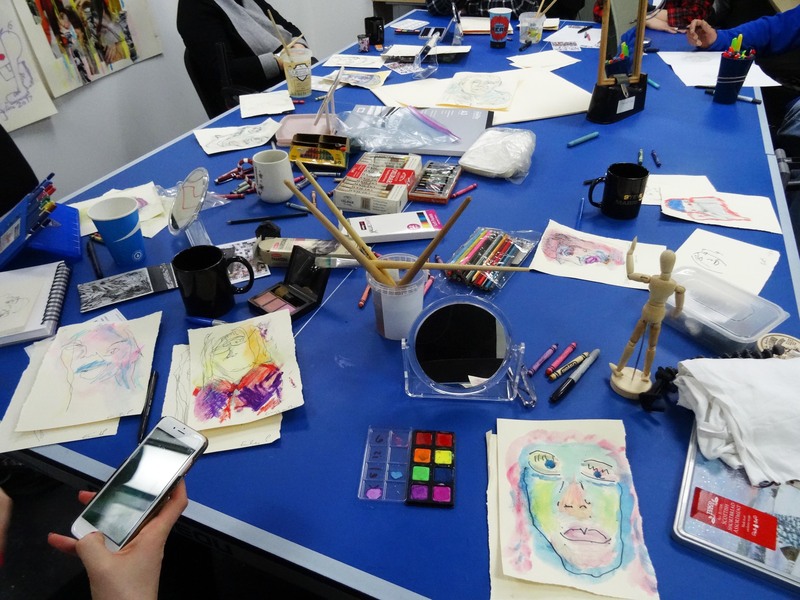 ‘Love Notes To Self’ art workshop at The Passage House, London. Photo credit Kelise Franclemont. Committed to “action” and “hands-on service”, I proposed to share one of the drawing exercises from my recently completed #365LoveNotesToSelf project and demonstrate how, through a simple act of looking and recording one’s own face in the mirror, anyone at anytime can give themselves the gift of a “Love Note To Self”. At the end of the morning, my hope was that not only would each person have a sketch or two to be proud of, and to have enjoyed making it, my firm wish was also that those around the table with me might have a glimpse of the positive impact I myself experienced over the past year by giving myself the care and attention that I so markedly deserved. C—– exploring colour in her self-portrait at Passage House, London. Photo credit Kelise Franclemont. Self-portrait by M—– at Passage House, London. Photo credit Kelise Franclemont. 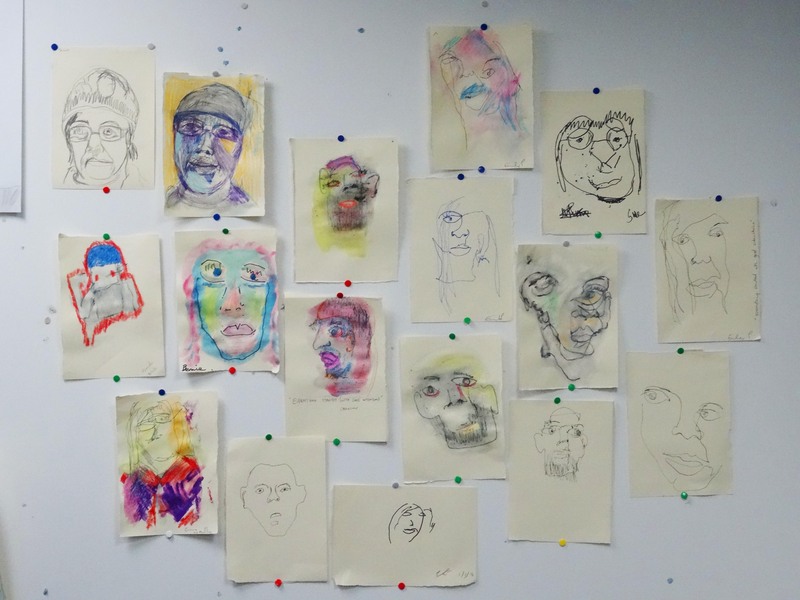 Blind-contour self-portraits by E—- at Passage House, London. Photo credit Kelise Franclemont. Self-portraits by S—— at Passage House, London. Photo credit Kelise Franclemont. With basic school materials such as graphite pencils, pan watercolour, ink pens and crayons, we had a hand at blind-contour drawing, which really boils down to nothing other than “notice what you notice” and “follow the line”. Before even letting the drawings settle, we attempted to “wreck” them by adding expressive colour and in some cases, brushing water over the whole surface, forcing ink and watercolour to move (but without much control over the matter), which contrary to expectations, really brought out something winsome in each character on the page. And what a lovely result. Everyone’s ‘Love Notes To Self’ at The Passage House, London. Photo credit Kelise Franclemont. This was never really just about drawing, though; from my side, I am so grateful to have had the chance to share a few hours with great people who were so patient and willing to try something new, maybe outside their comfort zone, sharing laughter and stories with me along the way. A final thought: if your company offers a volunteering allowance, don’t hesitate to find some way to contribute to or serve your community. You may even find that you gain much more than what you give when you give of yourself. David Tovey – London-based, formerly homeless artist, educator and activist who works in a range of media. He is a photographer, painter as well as an installation artist and performance-maker. Posted in projects, working artTagged collaboration, contemporary drawingBookmark the permalink.